Marie Gebert was extremely active at St. Teresa School as a mom to her Daughter Michelle Marie and her Son Sean Paul. Among her many supporting activities included coaching the girl’s basketball team. Marie was president of the K. of C. Woman’s Club and the Sherwood Golf Woman’s Club. She served as an AAU swimming competition official. Marie was active with numerous local charities and in local politics. Marie was deeply dedicated to her Catholic faith, her family and her community. 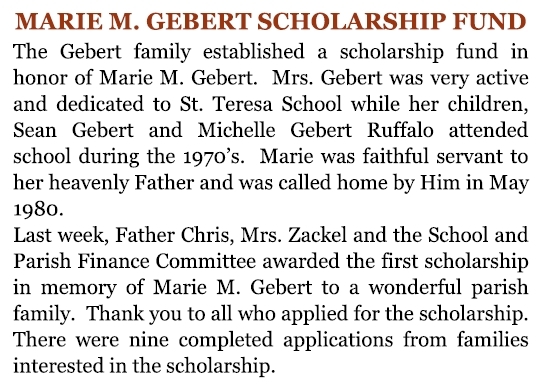 The purpose of the Marie Gebert Scholarship is to provide financial assistance to Catholic families that could not afford for their child to attend St. Teresa Catholic School. The St. Teresa School administration will award the Scholarship each year. The scholarship is sponsoring one child for the 2011-2012 school year who for economic reasons would be unable to attend St. Teresa Catholic School. The Announcement below appeared in the Sunday May 30. 2010 St. Teresa Catholic Church Bulletin. © 2012 TECHNET Enterprises of Florida, Florida All Rights Reserved.